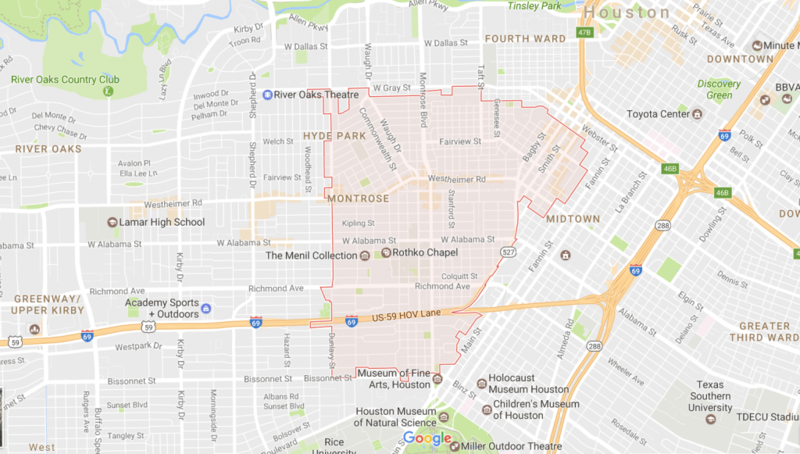 The Houston community of Montrose is a fun, diverse area that reflects a fascinating history. Dating back to 1911, the four-square-mile suburb boasted one of the first streetcars and Houston’s first apartment hotel. In the 1960s, the counterculture movement arrived — and left its mark. Today, Montrose is home to numerous communities including artists, musicians, LGBTQ, and artisans. Opportunities for fun and entertainment abound in the Montrose area. You can visit art museums, galleries, lovely chapels, historic buildings, thrift shops, and vintage stores. In fact, people travel from all over the city for ink from the tattoo parlors here in Montrose. Plus, there are tons of options for restaurants, with everything from trendy hot spots to dives and quaint coffee shops. As you can imagine, the nightlife doesn’t disappoint, either. Montrose is located in the 77006 zip code where housing is as beautiful and diverse as the folks who call it home. You’ll find old mansions, bungalows, and small cottages. If you aren’t interested in home ownership, apartments are readily available in the area. Are you moving into a new home in this cool neighborhood? Ameritex Montrose Movers can handle your home move every step of the way. We love the Montrose area and know it well. Our professionals help make every aspect of your move stress-free. Houston is an exceptional city for apartment dwellers. No matter if you choose an artistic loft or a trendy studio, we understand that apartment moves call for expert handling. Our apartment movers perform the move so you can focus on settling in and making Montrose home. For those setting up a new business, relocating, or moving a home office, Ameritex also offers commercial moves. No need to worry about the safety of your office equipment — we handle everything with the utmost care. Our office movers will have you up and running ASAP. Ameritex Montrose movers are known for providing our customers with a totally stress-free move, whether you book complete or partial services. Our full-service move is the definition of luxury, with our team taking care of all aspects of the move for you. Not in the market for such detailed help? That works, too! You can book individual services at your convenience. Are you considering a relocation to Montrose? Local moving companies like Ameritex get the job done better and faster. As a locally owned company with over a decade of experience, we are the best movers around. Be sure to contact Ameritex today or fill out our easy quote form at the top of the page. We would love to help you plan your perfect move.